Here is one of the few smallish, burnt-orange species of Lactarius that can be identified, at least tentatively, without recourse to microscopic examination. The stem of Lactarius subserifluus is what sets it apart; unlike the hollowing, brittle-fleshed, wimpy stems of most similar species, the long and skinny stem of this mushroom is tough and pliant, and rather non-Lactarius-ish--and its base is covered with strigose, orange to whitish hairs. Distinguishing microscopic features include round, reticulate spores and the absence of macrocystidia. Lactarius subserifluus is associated with oaks in eastern North America. 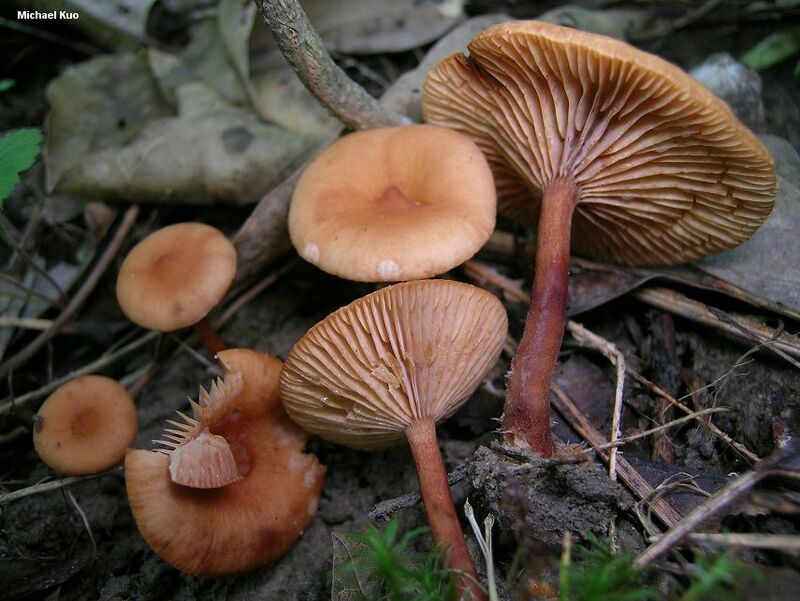 Lactarius strigosipes is a similar species described from Mexico (Montoya & Bandala, 2008), associated with hornbeam . 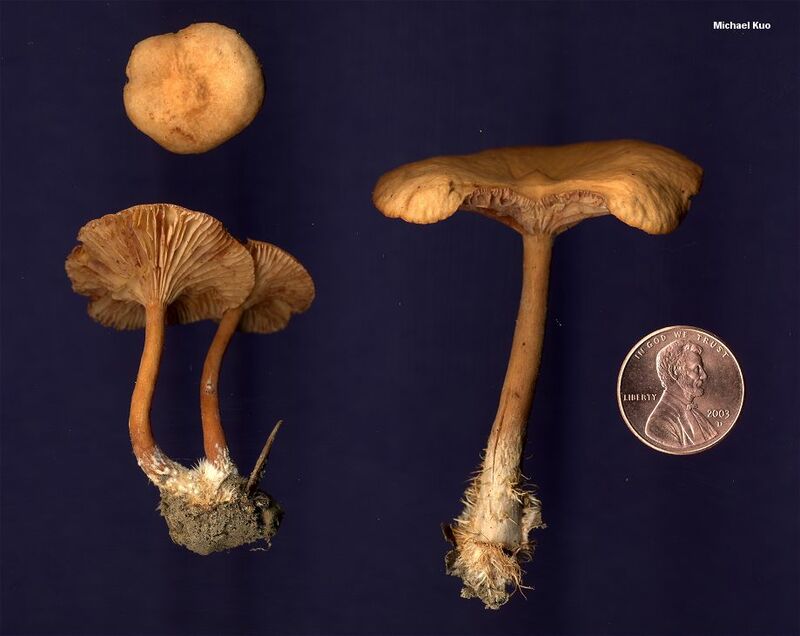 It features close, thin gills as well as an intense "spicy" odor and, under the microscope, nests of sphaerocysts throughout the cap and stem trama. Ecology: Mycorrhizal with oaks, primarily in oak-hickory woods; growing alone, scattered, or gregariously; June, July, and August; probably widely distributed east of the Great Plains. Cap: 2-7 cm; planoconvex developing a central depression and, at the center, a sharp bump; moist or dry; bald; brownish orange to rusty orange. Gills: Running down the stem; well spaced; creamy to pale yellowish at first, developing cinnamon spots and eventually discoloring cinnamon. Stem: 5-12 cm long; 3-7 mm thick; tough and flexible; more or less equal; bald; without potholes; cinnamon to rusty brown; dry; base covered with stiff orange to whitish hairs. Flesh: Pale brownish to pale cinnamon; not staining when sliced. Milk: Watery; not staining tissues, or staining the gills cinnamon; not staining white paper. Odor and Taste: Odor not distinctive, or fragrant; taste mild or slightly peppery. 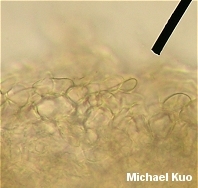 Microscopic Features: Spores 6-7.5 x 6-7 µ; subglobose; ornamentation 1.0-1.5 µ high, as amyloid warts and ridges that form partial to nearly complete reticula. Macrocystidia absent. Pileipellis a hyphoepithelium. 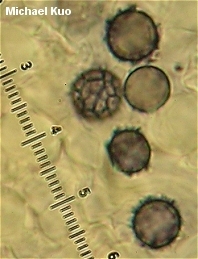 Nests of sphaerocysts not present in cap and stem trama. REFERENCES: Longyear, 1902. (Hesler & Smith, 1979; Smith, Smith & Weber, 1979.) Herb. Kuo 08270217, 07220312, 06280807.